Kickfit martial arts and fitness academy has been open since 1996 and continues to teach the martial way. Located in Nottingham city centre, the martial arts academy is run by chief instructor Master Richard Hudson 6th Dan Black Belt and offers an excellent range of international martial arts and fitness tuition in large premises with two main teaching rooms, a weights room, changing rooms and shop. Master Richard Hudson's method of instruction involves training his students in a wide variety of skills, constantly showing new ways and techniques to counter attacks. The academy has trained a large number of champions (including world champions) and medal winners from various competitions and continues to do so. All students are encouraged to help one another within a class and this culture allows beginners and intermediate students to train together successfully - students learn from instructors and instructors learn from students. All classes have a grading system and students are encouraged to attain these levels on a regular basis. However, the emphasis remains to learn a wide skill base rather than sticking to the confines of a single grading at a time. Master Richard Hudson trained in the Philippines under the great Eskrima instructors Grand Master Danny Guba, Grand Master Cacoy Canete, Grand Master Dionisio A Canete, Master Evlogio A Canete Jr, Grand Master Felimon D "Momoy" Canete, Grand Master Vicente "Inting" Carin and Grand Master Antonio Ilustrisimo. In March 2001 Master Richard Hudson won the world championship title in Los Angeles competing in the Cacoy's Doce Pares World Invitational Championships having previously been National and British Champion in 1997, 1996 and 1993 and also British Kickboxing Champion in 1993. In February 2002 he was awarded his 6th Dan Black Belt and was promoted to "Master" by Grandmaster Danny Guba - head of Doce Pares Europe. In 1998 Master Richard Hudson was accepted onto Richard Bustillo's instructor programme. Richard Bustillo studied Jeet Kune Do under the legendary Bruce Lee and is now Director and Chief Instructor of the International Martial Arts Boxing Academy in California. 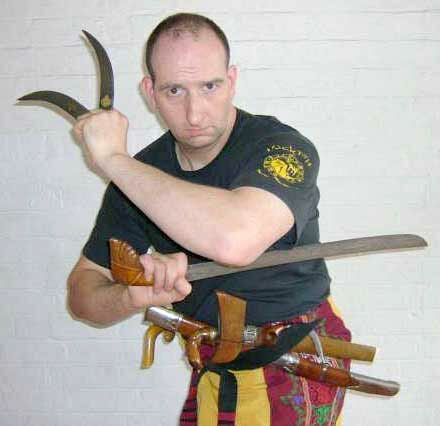 Master Richard Hudson is also a Muay Thai and kickboxing Instructor with the United Thai and kickboxing Federation, a full Instructor in Hsiu Lung Tao, a member of the British Eskrima Federation and Member of the World Eskrima Kali Arnis Federation. In his time Master Richard Hudson has also been bodyguard to Rod Stewart, Noddy Holder, Anthea Turner and Sinita.